This is an abstract of the story I read many-many years ago. Since I remembered neither the author nor the name of the story, I tried all the searches I could think of and didn’t find it online. So I did my best reconstructing it from memory. I wanted to share it with you because it was the first association I got when I heard the perfume name Captured in Amber. Not just the story itself but that warm feeling from the generous and completely altruistic gesture of friendship: Emma, whom Ann would probably never see again since they were too little and lived too far away from each other, not only gifted her friend with her own amber but made it in a manner that ensured that Ann couldn’t refuse it. I find it fascinating that Shelley Waddington, the founder of En Voyage Perfumes and the creator of Captured in Amber, included in the composition both ambers known in perfumery: the accord created from labdanum, benzoin, vanilla, etc. and ambergris, which used to be known as amber before this name was adopted to mean “Baltic amber (fossil resin).” You could say that this perfume is a study in amber. It would be perfect to conclude this post with a picture of Rusty sniffing a bottle of Captured in Amber but I still can’t decide which concentration I should buy – eau de parfum or parfum extrait. As soon as I make up my mind I promise to make it up to you. Images: pendant – from Via Valeron online store; ring – my own. # MS Word spell check insistently tried to replace “urinous” with “ruinous”; not just suggesting but actively substituting. It’s not completely wrong: urinous honey note in perfume is ruinous to my enjoyment of the said perfume indeed but still I prefer a software application not to put words into my mouth, so to speak. This entry was posted in Acquaintance with letters, Not a Review and tagged amber, Captured in Amber, En Voyage Perfumes, Shelley Waddington. Bookmark the permalink. I loved this post on all sorts of levels, despite the lack of an amber-coloured Rusty to top off our reading pleasure. What a heartwarming tale of friendship and generosity, and I am not surprised it was the association that sprang to mind when you tried the scent. I shall wear my sample of Captured in Amber today, intrigued about the fact that there are different types of amber in there. I also have some amber drop earrings somewhere which I must dig out. Amber was never the same to me again after I visited a magnificent museum devoted entirely to the subject, in the crypt of Malbork Castle, near Gdansk in Poland. I bought a friend a neckace from the gift shop, which always takes me back to that trip when I see her wearing it. Now I want to visit that museum! And the recreated Amber Chamber. Though the former is more likely to happen than latter, taking into the account current political situation. I thought about using “amber-colored” modifier but then decided it would be pushing.Thank you for mentioning it :) Rusty definitely suits the topic. How nice it is when a perfume lives up to its name. I’d like to try this now, I like the sound of (non pissy!) honey and amber. I also want amber perfumes to be as warm and viscous as the jewel itself. As somebody who recently wore many amber perfumes for a month, I should say that this one is a very different amber. It’s not one of the “nice” perfumes: most likely, you’ll either like it a lot or strongly dislike it. But I think it’s worth trying. Fantastic post! Such a lovely story. I can see why it stayed with you and I’m glad you reconstructed it for us. Captured in Amber is something special. It must be to capture Val and me, as we are not usually amber lovers. Your amber ring is lovely, I have one too. I think I remember you having an amber pendant as well. Looking forward to an update with a Rusty pic. Too true about urinous leading to ruinous! Tara, it was you who attracted my attention to this perfume when you reviewed the trio – thank you! I do have an amber necklace. It’s a set with the ring. If you scroll up to the Related posts, one of them have a picture of that necklace. What a beautiful story and what an amazing token of summer friendship. Even though the girls probably never met again I’m sure that Ann had Emma in her mind for a very very long time. Your description of Captured in Amber is very appealing, a sweetened amber is exactly the amber that I like. Too bad all those natural perfumes from the US perfumers are hard to get to Europe. But maybe one day I will try it. Knowing life back then in the Soviet Union, I should say that there was almost no chance for those girls to meet again – that’s why the gesture was especially touching for me. What a lovely story – even short friendships can offer us so much. 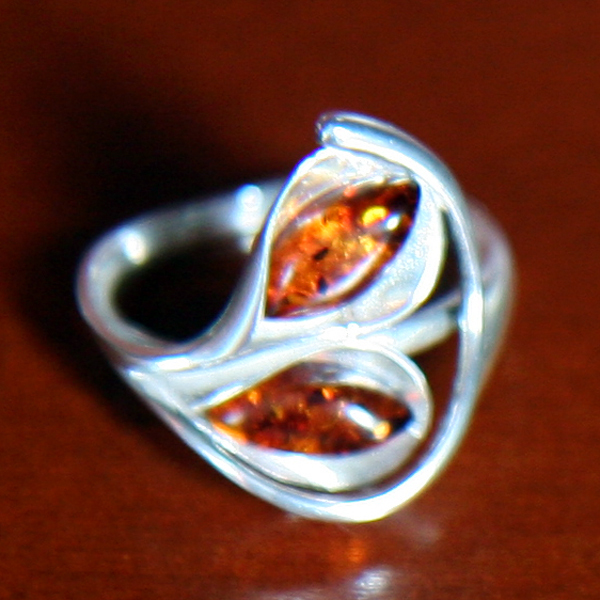 I love amber jewelry ever since a trip to Denmark where I purchased 2 rings. One unfortunately got lost in a move, but the other I still treasure. So far I haven’t found an amber perfume that I like, but this one does sound intriguing. I’ve read so many great things about En Voyage perfumes. On another amber note, have you heard of/tried Ambre by Brooklyn Perfume Company? Apparently it features amber the resin, as is found in jewelry. It’s part of Twisted Lily’s best of 2014 sampler. Interesting, I think. Sun, you’ll find more than one amber to like. I have to say that I didn’t like any of the ambers that you recently mentioned in one of your comments you tried (I’m not sure it was on my blog). In my opinion, Captured in Amber isn’t even close to a typical amber perfume so you might love it or hate it unrelated to how you feel about other amber perfumes. I haven’t heard about that perfume/brand until I ran a search after reading your comment. It’s an interesting idea though I still am not persuaded how exactly they’ve diluted a non-dilutable substance but, I guess, this story isn’t worse than all those about royal recipes – so if I get a chance I’ll try it. I love amber jewelry too. I have a pin from Poland and a pendant from Russia. A lot of the perfumes I have include an amber note but I’m not sure I have one that’s primarily an amber fragrance. I need to fix that. This one might be worth sampling for me since I do love a good honey note. Since you’re in the U.S. where this perfume is available for testing, you should try getting a sample of it. It won’t fix your “amber problem” since it’s not a straight-forward amber (such as, for example, SL Ambre Sultan, Dior Mitzah or By Kilian Amber Oud) but it might be just what you need. What a lovely story, Undina! And of course, you win the prize of my first perfume lemming of the year and on top of that, a lemming to acquire amber jewelry (just one, not a whole collection). “En Voyage” keeps whispering in my brain but I have so far resisted even buying samples. Thank you, hajusuuri. I see just one problem with Captured in Amber extrait for you: it’s a tiny bottle (less than 5 ml, dab I assume) and you’re supposed to apply it directly to skin. You might want to go with EdP but I haven’t tested this one so I don’t know if I feel the same about it. Though Ms. Waddington says that the composition is identical, it’s just the concentration that is different. But according to Cookie Queen those two smell different to her. That is a very sweet story. I really must try En Voyage perfumes- this ones sounds lovely as does Zelda. 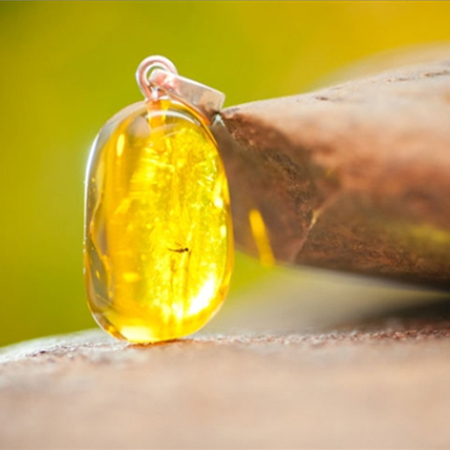 Like the ‘commenters’ above- your post makes me want to explore amber jewelry- i think the only thing i have is an amber (?) teething necklace lol. And of course enjoyed your postscript! Thank you, Lavanya! I think you might like the other perfumes from this collection as well. What is nice about amber jewelry: it’s not expensive. So unless you want to put half of the Amber Room around your neck, you can find a very nice necklace, bracelet or ring for relatively cheap. At our local Costco they have a jewelry show a couple of times a year and amber jewelry from Poland always attract my attention. Your enjoyable tale tied into my childhood memories in a very nice way and so perfectly ties together scent and memory. Thank you for this lovely article, and for the warm comments that I so greatly appreciate as well. Thank you, Shelley! It’s such an enjoyable perfume. A perfectly lovely review of an equally lovely perfume. Magpie, I don’t know your tastes well enough yet but it might be just the right perfume for your next Christmas (it would fit very nice into your fireplace-tree-perfumes theme :) ). Undina, you make Captured Amber sound scrumptious – and naturally, I loved the beautiful tale of friendship! Is the amber pendant that you pictured as golden yellow as it appears on my computer screen? It looks like honey that a fly got caught in, shot through with sunlight. Very nicely matched to your description of the perfume. It’s not my pendant (and picture of it) – as I truthfully told in the Images disclaimer. So my guess is as good as yours. I just thought it was a good illustration for the story and the perfume (and yes, on my monitor it does look golden as well). Captured in Amber–for me, this post was instructive about perfumes, fragrances–in order to describe a fragrance, there must also be a memorable emotion and experience that at a certain point in time attached themselves to the fragrance–the experience and emotion resurfaces each time the scent enters either our memory or olfactory receptors. I’ve been hunting for a key to strengthen my own scent descriptive abilities and I think you have just shown the way. Thank you, Undina, for the post. You’re welcome, flahertylandscape. Most of my posts are rather stories, connection to my memories and emotions than real perfume reviews. From my experience: I rarely get useful for me information from people’s description of how perfume smells – even when I know those people and their tastes. So I prefer to get their visceral response to what they try as well as thoughts and associations.